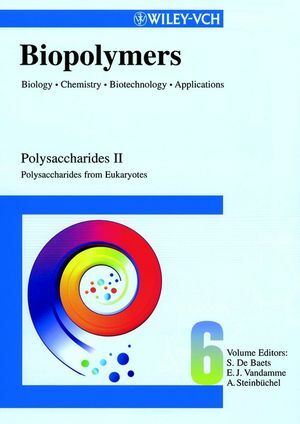 Volumes 5 and 6 focus on simple and complex polysaccharides synthesized by organisms as storage compounds, cell wall constituents or compounds at the surfaces of cells. They describe biosynthesis, metabolism, biodegradation, functions, properties and applications of these biopolymers, covering such topics as: agar, alginates, alternan, carrageenan, cellulose, cell wall polysaccharides from fungi, fucogel, chitin, chitosan, curdlan, dextran, elsinan, emulsan, gellan, glycogen, glycolipids, glycopeptides, gums, hemicellulose, hyaluronan, inulin, levan, lipopolysaccharides and other eps, peptidoglycans from archaea and bacteria, pectin, pullulan, schizophyllan, scleroglucan, succinoglycan, starch, teichoic acids, teichuronic acids, xanthan. Scleroglucan (I. Giavasis, et al.). Yeast Extracellular Polysaccharides (S. De Baets, et al.). Chitin and Chitosan in Fungi (M. Peter). Fungal Cell Wall Glycans (S.-C. Jong). Cell-Wall β-Glucans of Saccharomyces cerevisiae (G. Dijkgraaf, et al.). Alginates from Algae (K. Draget, et al.). Carrageenan (F. de Velde, et al.). Cellulose (D. Klemm, et al.). Seed Gums (S. Dierckx & K. Dewettinck). Pectins (M.-C. Ralet, et al.). Starch (R. Tester & J. Karkalas). Inulin (A. Franck & L. De Leenheer). Chitin and Chitosan from Animal Sources (M. Peter). Proteoglycans (Glycosaminoglycans/Mucopolysaccharides) (T. Nakano, et al. ).